Each $93 box contains 10 packs. Each pack contains 100 sleeves. Each box contains 10 packs of 100 sleeves that hold standard size cards like Magic the Gathering, Pokemon, L5R, etc. Dragon Shield sleeves are designed to protect your gaming cards against the wear and tear of play use. 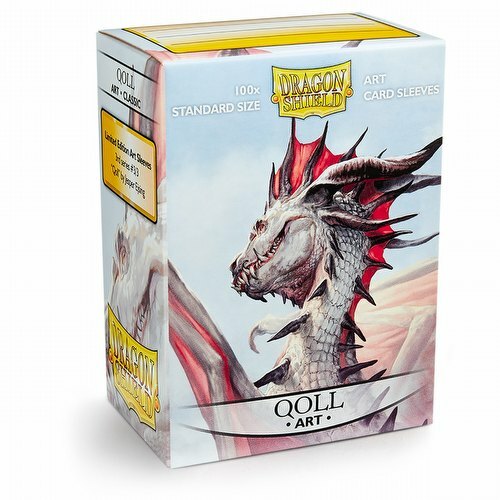 Dragon Shield art sleeves are printed directly on a Dragon Shield sleeve. No layers. No splitting. Only beautiful artwork and a long-lasting protection. These Classic sleeves are smooth with a glossy back, featuring unparalleled seal strength. Sleeves have a clear front and Qoll artwork by Jesper Ejsing and fit cards measuring up to 2.5" x 3.5" (63mm x 88mm). PVC-free 120 micron polypropylene. No acid. Archival safe. Sturdy cardboard box fits 75+ cards, including sleeves. Box lid has a label for your personal use.